Welcome to the Algansee Library! 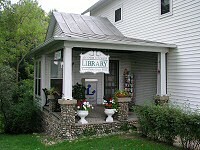 We have a small library in a small village, but we are big on library service and activities. We offer books, magazines, movies, and computers for our patrons. There is always a craft table set up for the children. In addition we have story times and programs all through the year. We hope to see you soon! Drop in anytime to put together a flower pot and flower to give to a loved one (or keep for yourself). All materials will be provided. Drop in anytime during our open hours at the Algansee Branch for this fun craft. We will be painting a ceramic ladybug penny ban! All supplies will be provided and all ages are welcome! Drop in any time on Saturday, January 19 between 9am and 12pm for a Group Puzzle Project and Pizza! Join us on Wednesday, October 17 at 2:00pm to see Stevens Puppets perform The Wizard of Oz! This program will be held at the Pine Ridge Bible Church, 280 S. Ray Quincy Rd., Quincy, not at the Algansee Branch.